Today I am honoured to feature a guest post by one of the best up and coming children’s authors around. 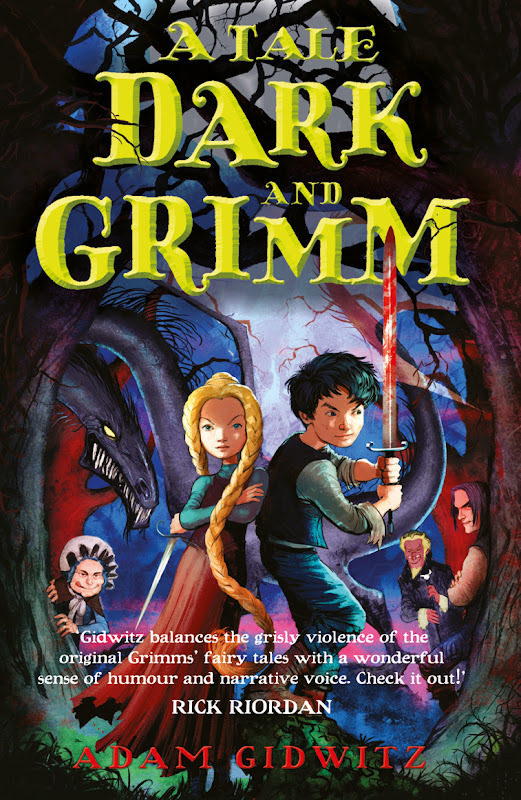 Adam Gidwitz is author of A Tale Dark and Grimm which I reviewed in August and today he will tell us his origin story. Thank you Adam for this wonderful, witty and entertaining story! This is the origin story of the writer they call Adam Gidwitz. Young Adam was blown away. The sheer tautological brilliance of it was astonishing. Writers DO write! Wow! Then he stopped to consider. Did he write? Well, he wrote in class, when his teachers asked him too. And he wrote for homework, when his teachers made him. But did he wrote on his own? For fun? And so, right then, at age twelve, Adam decided that he was not a writer, and the occupation of writer was stricken from his “career possibilities” list, to be followed, a few years later, by playing basketball for the Chicago Bulls (this was after average half a point a game, or one basket every four games, for his JV basketball team). But Adam was wrong to strike “writer” from the list of possibilities. Indeed, he was already a writer. This was how young Adam spent his time: not writing, but bent over plastic action figures, making them talk and fight and telling stories with them. Or out at the basketball hoop behind his home, taking shots and narrating his long and storied career in the NBA to the surrounding trees and asphalt. He was writing all the time; he just never wrote anything he wrote down. If you know what I mean. Ten years went by, and Adam went to college, majored in English literature, and then got a job teaching seven year olds. Because this is about all a degree in English literature qualifies you for. Adam found he was not very good at teaching seven year olds. The key to teaching seven year olds is to get them to shut up for more than three minutes. If you can get them to shut up for more than three minutes, you have a chance of teaching them something. For the first many months of “teaching” seven year olds, Adam taught them absolutely nothing. And then, one day, he discovered something. It was a mad day in his classroom. Harry was in one corner hitting another child on the head with a wooden block. Mick was jumping up and down on a table and screaming at the top of his lungs. And Reed was gluing cotton balls to his face and singing Christmas carols, even though it was April. In other words, it was a perfectly typical day in Adam’s classroom. Adam stood on the rug, shouting at Harry to stop braining his poor classmate, at Mick to stop jumping on the table, and at Reed to stop gluing things to his face. To no effect whatsoever. And then, something crucial to the course of Adam’s life occurred. He sat down in his teacher chair and said to himself, “I don’t give a rat’s behind what they do anymore.” And so he turned to the three children actually sitting on the rug and attending to him, and he decided that, instead of teaching them anything, he would just tell them a story. It was, after all, what he felt like doing. He started, as he must, with “Once upon a time.” And Harry, over in the corner, lifted the wooden block in the air to brain his poor classmate—and then stopped. Mick continued to jump up and down and Reed kept singing. But Adam pressed on. “There was a poor woodcutter, who lived in a house with his wife and two little children.” The crashing of Mick’s feet on the table suddenly ceased. Harry, Adam noticed, was now sitting just outside of the rug, a block cradled in his lap. Reed put some glue in his mouth and continued to hum to himself. “One night,” Adam went on, “the wife turned to her husband in bed and said, ‘We must get rid of the children, or else we will starve to death.’” Mick was now sitting on the table, his legs swinging back and forth, and Reed put down his cotton balls. It was on this day that Adam decided his entire teaching career would revolve around telling stories, for it seemed to be the only thing he was good at. And so it transpired. The rest of the year went swimmingly: The children were all well-behaved, and Adam started writing down the stories he told the children, exactly as he told them, in books. Which soon were published, in the US and in the UK. And everyone lived happily ever after. Except for Reed. The glue gave him a skin condition.